Posy Busby spends her days thinking about microscopic organisms that live in between the cells of a plant. Busby, a postdoctoral fellow jointly appointed with the University of Washington and the University of Idaho, studies how specific fungal microorganisms, known as leaf endophytes, help plants thrive. 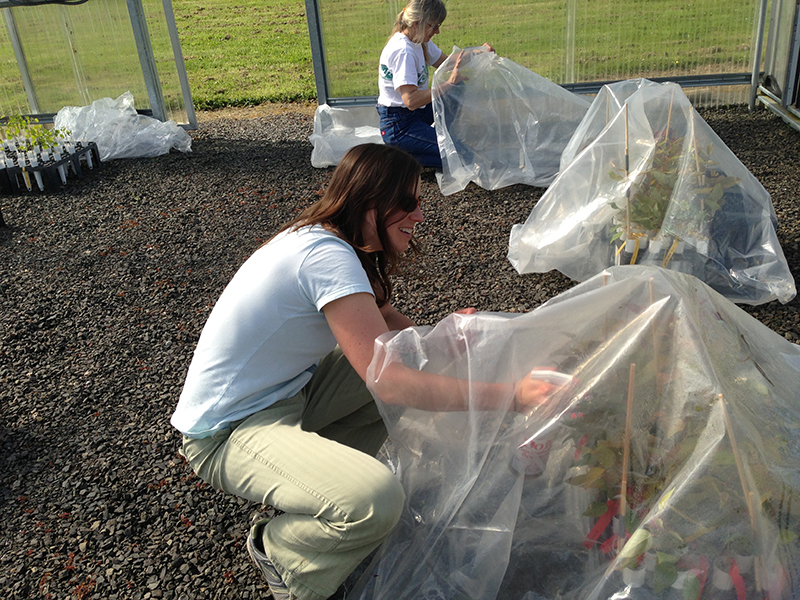 As a member of the Advanced Hardwood Biofuels Northwest (AHB) Feedstock Team, she is working to discover which leaf endophytes help hybrid poplars resist disease and how they work. Busby’s work takes place in the realm of the hybrid poplar microbiome–the community of microorganisms that inhabit the trees. Endophytes, which live symbiotically within plants, play a number of beneficial roles from delivering nutrition to the plant and promoting root growth, to fighting disease. Busby is characterizing the fungal communities in the leaves of black cottonwood (Populus trichocarpa) and trying to understand their role in disease resistance. What she is learning is that particular endophytes found in the cells of poplar leaves help fight Melampsora rust, a major disease of poplar. So far, experiments inoculating black cottonwood with individual leaf endophytes have yielded impressive disease resistance results in the lab. In field trials in Jefferson, Oregon, the severity of the rust in leaves inoculated with endophytes was reduced by 50 percent. Posy Busby inoculates poplar with endophytes. (Photo by Rich Shuren). Busby is also learning that an interplay between a plant’s genetic defense response and components of the microbiome like endophytes is taking place. “Endophytes may interact both directly with rust, and with the plant’s genetic resistance,” Busby said. She is working with the US Department of Energy Plant Microbe Interfaces group to more fully understand this dynamic. “I think this research can lead to a more sustainable way to manage disease,” Busby said. In the 1990s, many poplar tree farms were infected by a particularly virulent hybrid rust that had arrived on the scene. Desperate for a solution to manage this epidemic, many growers in the Pacific Northwest found respite by replacing native black cottonwood stock with exotic hybrid poplars that were resistant to the rust. Returning native black cottonwoods to the landscape today would benefit the many organisms, from micro to macro flora and fauna, which have coevolved with and come to depend on the native trees. Posy Busby conducting field research with black cottonwood. (Photo by Rich Shuren). Managing poplar disease with microbes like leaf endophytes could also reduce the need for chemical fungicides. But the road from here to there is still uncertain. Busby will collaborate with AHB Feedstock Team partners like Greenwood Resources, Inc. to assess the economic viability of managing disease with endophytes and to work out the practical considerations of how to apply endophytes to leaves on a commercial scale. Ultimately, Busby envisions a disease resistance strategy for biofuel tree farms that integrates her research on endophytes with traditional breeding for plant genetic resistance, resulting in ecological management tools that are available to a variety of poplar growers. Busby et al. 2013. Leaf endophytes and Populus genotype affect severity of damage from the necrotrophic leaf pathogen, Drepanopeziza populi. Ecosphere 4(10):125. Raghavendra and Newcombe. 2012. The contribution of foliar endophytes to quantitative resistance to Melampsora rust. New Phytologist 197(3).